What is a Manufacturing Budget? Home » Accounting Dictionary » What is a Manufacturing Budget? Definition: A manufacturing budget is a set of three budgets that estimate the cost of direct materials, direct labor, and overhead for the number of units predicted to be produced in the production budget. In other words, the manufacturing budget estimates how much it will cost the company to produce the number of products included the production budget. What Does Manufacturing Budget Mean? During each stage of production, a manufacturer creates a budget to help track and record the expenses of producing a product. This budget not only allows the manufacturer to analyze and cut costs in the future, but it also helps the manufacturer set selling prices for customers. 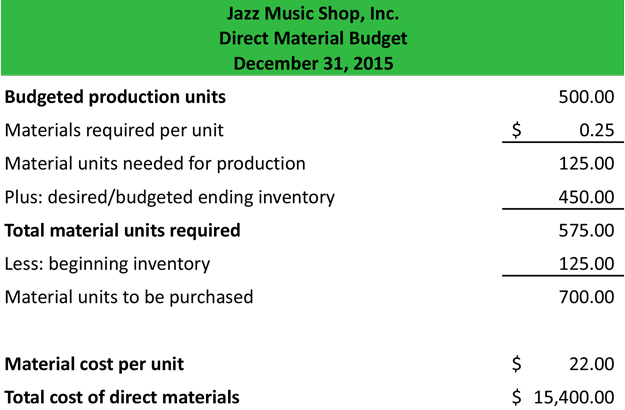 These production budgets include the number of units to be produced each period. Part of each production budget includes the manufacturing budget. The manufacturing budget is usually split into three separate reports or budgets: direct material, direct labor, and factory overhead. The direct materials budget will include the raw materials needed for each product, the budgeted beginning and ending inventory, raw material costs, as well as number of units set to be produced. The direct labor budget computes the total number of labor hours need by multiplying the number of units set to be produced by the estimated number of hours required to produce each unit. The total number of hours needed can then be multiplied by the estimated hourly cost of labor to arrive at the total budgeted labor cost. The overhead budget splits overhead costs into fixed and variable overhead. The variable overhead is multiplied by the number of units produced and then added to the fixed overhead. This total estimated overhead can be used to project the future costs of production. 1 What Does Manufacturing Budget Mean?